Guest blog post by Daniel McCarthy, CEO of The Music Bed. I was emailing back and forth with Chris Jones (a friend / wedding filmmaker / TMB user) a few weeks back and he made a great observation about the advantages of creating complete transparency between musicians and filmmakers. He nailed it on the head! Ultimately, there is something deeper than just paying to license a song because it is the legal thing to do. In our opinion when you license a song it gives transparency to the transaction, and it allows every party involved to openly support the other parties. 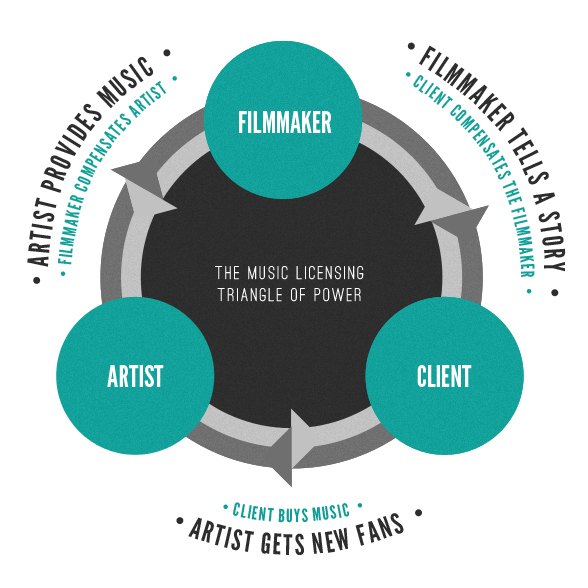 The artist makes music that the filmmaker can use to create an incredible connection with the film and the client, and then the client is now a new fan of the artist. Clients hire Filmmakers to create films, who need music to put in those films, who compensate the artist for their music so that they can keep making music for their fans (you and your clients). That triangle is the direct effect of the license. However, the indirect effect is really hard to quantify. When everyone is playing by the rules, it allows for everyone to talk freely and share freely. From a practical standpoint that means the filmmaker can now mention the artist in social posts and on blog posts, etc. And the artist can return the favor by sharing the films with their fans and followers. In my opinion, while the legal reasons are probably worth your money spent on The Music Bed, the value is in the transparency, relationships & mutual support. Daniel is CEO of The Music Bed, and a former professional event filmmaker. TMB offers videographers and photographers affordable licenses to amazing songs that can be used for weddings, events, commercial work, short films, non-profits and more.